The Village at Fort Vancouver National Historic Site is a place of connections — a historical grand emporium where the history of people, things, events, and ideas have flourished. It hasn't always been so. Just a few years ago, only the most intrepid park visitor would have ventured far enough to discover that during the late 1820s to 1860s, the fur trade era, several hundred working class employees of the British Hudson’s Bay Company and their families lived at this site. Sandwiched geographically by an interstate highway, a state highway, a major rail line, an airfield, and an active Army post, the Village was unknowingly passed over by millions of people each year. 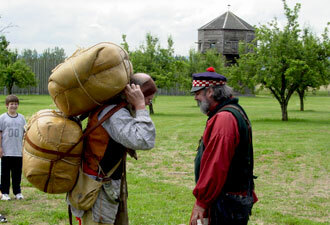 Before recent restorations, only a few buildings within the reconstructed stockade shared information about the Hudson’s Bay Company, its elite officers, and their role onsite. Luckily, for today's visitors, this has all changed. Reconstructed buildings, an accessible trail, and an orchard now stand in place of brier thickets and overgrown weeds. Interpretive signs place the Village story in historical context. A series of free award-winning mobile apps reveal its Hawaiian connections. Archeology and public history field schools investigate the site and tell folks about it. A world-class Land Bridge physically connects the Village to the Columbia River waterfront and a network of great trails. While not evident to the visitor, partnerships have been key to this transition. Today visitors can follow a half-mile accessible recreation trail, built in cooperation with the city of Vancouver, from Fifth Street through the Village. Following this trail, visitors pass the new orchard where, thanks to a partnership with Oregon State University, trees share genetic stock of the locally famed Old Apple Tree — the oldest living apple tree in the Pacific Northwest. A spur trail, wayside exhibits, historic fencing, and two cabin-like buildings are clues that you've reached the Village, where fur trade employees — English, French-Canadian, Scottish, Irish, Hawaiian, Iroquois, and more than 30 regional Native American groups — lived and worked. Two reconstructed Village houses stand at their original sites, built with storm-downed Douglas fir provided by the U.S. Forest Service and neighboring national parks such as Lewis & Clark National Historical Park and Mount Rainier National Park. The site's archeological study, design, and construction were achieved through partnerships with the University of Oregon, Portland State University, Washington State University, and North Cascades National Park. Visit the houses for tours, cultural demonstrations, living history, and curriculum-based education programs. 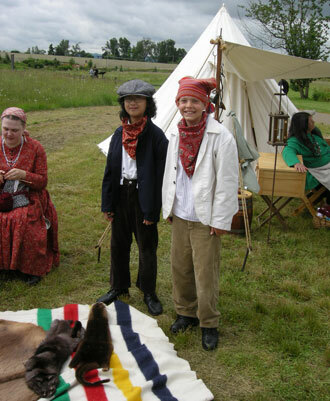 A great way to experience the Village is through the Fort Vancouver Mobile application (app), a partnership project between the park and the Creative Media & Digital Culture Program at Washington State University-Vancouver. These free apps share student- and faculty-created media – including short films, animations, interviews, and interactive games. One of the best views of the Village today is atop the Vancouver Land Bridge. Visitors can cross over the highway, walking between the site and the Columbia River via the landscaped connector, a $12.25 million partnership project spearheaded by the non-profit Confluence Project, Maya Lin and site architect Johnpaul Jones. From this vantage point, visitors can see how far things have come, and what the future holds. The addition of the East & South Vancouver Barracks to the national park in May 2012 brought 33 acres and 20 historic buildings into the area. Plans are moving ahead to transform a former Army hangar building into a state-of-the-art curation facility and museum that will house collections for more than a half dozen national parks. 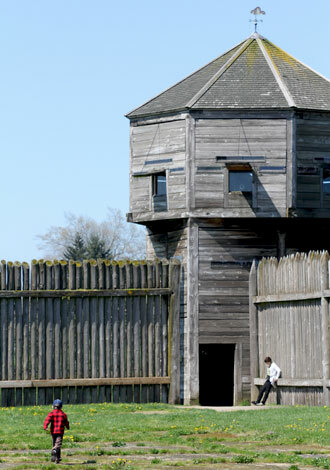 From history enthusiast to recreational walker, the Village at Fort Vancouver offers many ways for visitors to connect to this unique national park and forge a special relationship with this place. Come experience it!